If you’re a pop tart lover then you have to try this gluten free and dairy free giant strawberry pop tart! It’s as delicious as it looks with a flaky gluten free pastry, a luscious strawberry filling and a sweet glaze on top. Kids and adults alike will love this breakfast pastry. When you’re having brunch, you better go big or go home. In this case, we’re doing both! 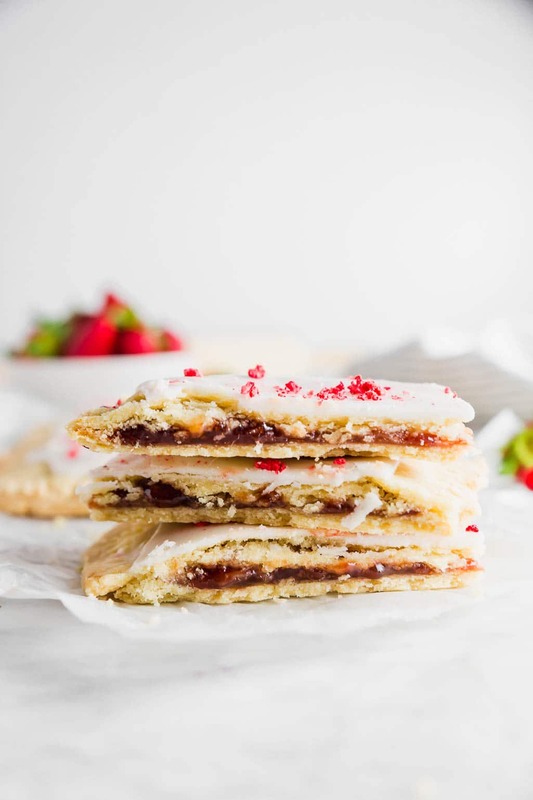 You can make this amazing gluten free giant strawberry pop tart at home! It’s the perfect breakfast treat for a brunch with the girls or just a treat that your kids will absolutely love. Trust me, this giant pop tart will make you feel nostalgic about your childhood. We all had our favorite pop tarts growing up, right? In fact, I had two. The brown sugar cinnamon pop tart (which you should try my giant brown sugar cinnamon pop tart recipe… it will knock your socks off) and the frosted strawberry pop tart! If you’re gluten free or dairy free, pop tarts no longer have to be a thing of the past. 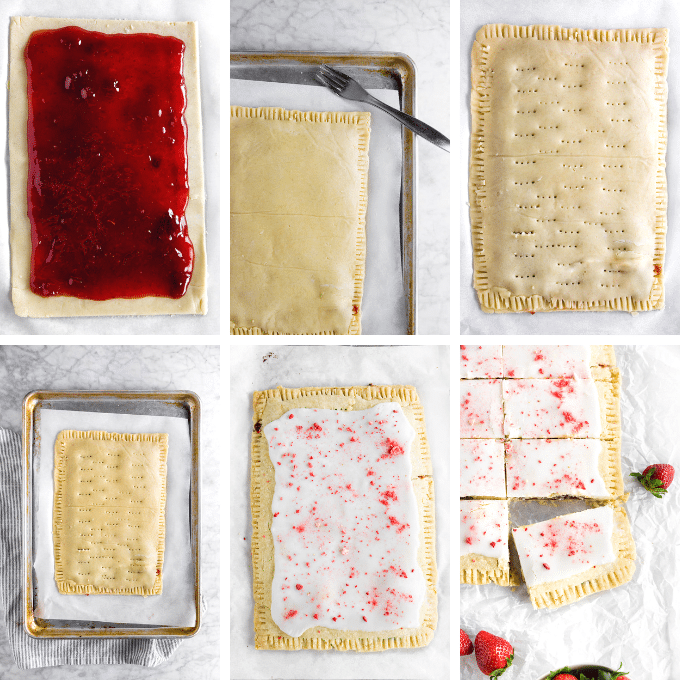 This gluten free strawberry pop tart is so easy to make from scratch! What Makes this Giant Strawberry Pop Tart Gluten Free? 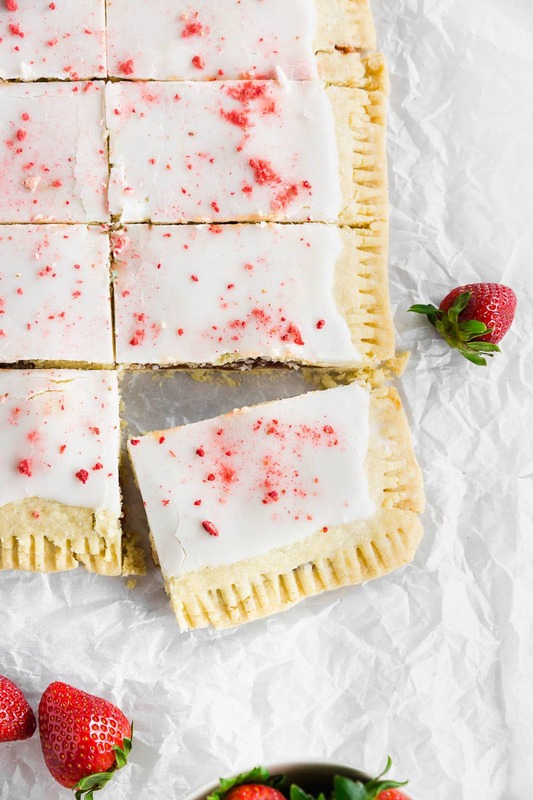 A gluten free flour blend is all you need to create this epic giant strawberry pop tart. I’ve used a few blends successfully to make this gluten free pop tart. Some of my favorites are Bob’s Red Mill Gluten-Free 1-to-1 Baking Flour, Cup4Cup Gluten-Free Multipurpose Flour and gf Jules All Purpose Gluten Free Flour. If your gluten free flour blend doesn’t have xanthan gum in it, add 2 teaspoons of xanthan gum to your gluten free flour. Can I make this pop tart recipe with regular butter? Yes! If you don’t need to be dairy free, this giant strawberry pop tart is just as delicious with regular butter. I’ve tested it so I know it works. Just swap the vegan butter called for in this recipe 1-to-1 with regular unsalted butter! This giant pop tart is dairy free. How do I make it vegan? This pop tart recipe does not contain any dairy, eggs or animal products. If you are vegan, you will need to make sure you buy the correct sugars to make this pop tart recipe vegan. Some sugars are refined with bone char, which is what makes them not vegan. 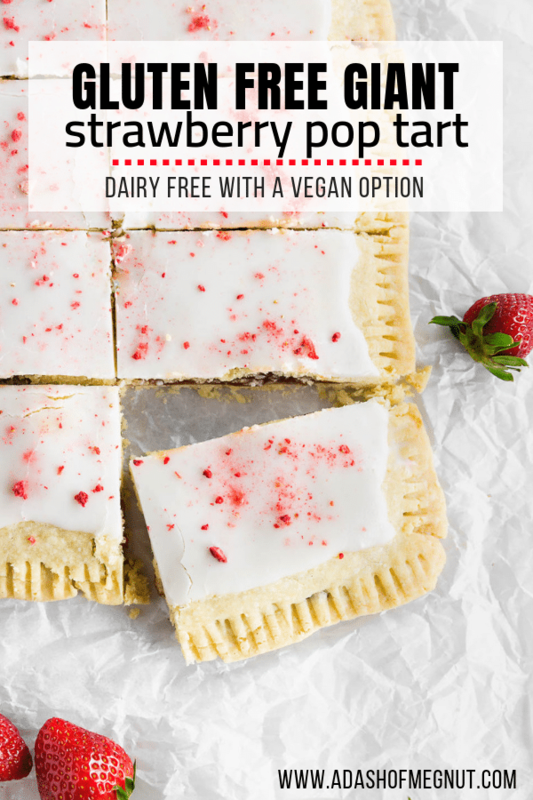 If you replace the granulated sugar and powdered sugar with vegan approved sugars and follow the rest of the recipe as written, you’re good to go with a terrific vegan pop tart! Can I make smaller pop tarts instead of a giant pop tart? If you don’t want to make a giant pop tart that’s okay! You can make smaller pop tarts with this recipe. The recipe will make about 6 smaller sized pop tarts. Just cut the dough into 12 equal rectangular pieces and make sure to pinch around the edges with a fork to seal the jam in the pop tart. You may need to lower the bake time to about 20-25 minutes, rather than the regular 40-45 minutes that this giant pop tart recipe requires. If strawberry jam isn’t your thing, you can use other fruit jams in it’s place. Blackberry, blueberry, and raspberry are all great choices for this gluten free pop tart. You can also use orange marmalade if you want to go with a citrus for the filling. Why do you add cornstarch to the jam filling? While you could skip the step of adding cornstarch to the jam filling, I think it’s a great addition to this recipe. Adding cornstarch to the filling makes it a thicker, stiffer consistency which is perfect for a giant pop tart. I have also tested it without the cornstarch step and the recipe will still work and taste good. The jam filling will just be more liquidy when you take a bite. As a note, you should add the cornstarch to the jam while it’s warm. Also, the reason you first stir together the cornstarch and water before adding to the jam is that otherwise the cornstarch will clump up and there will be large white chunks in your filling. 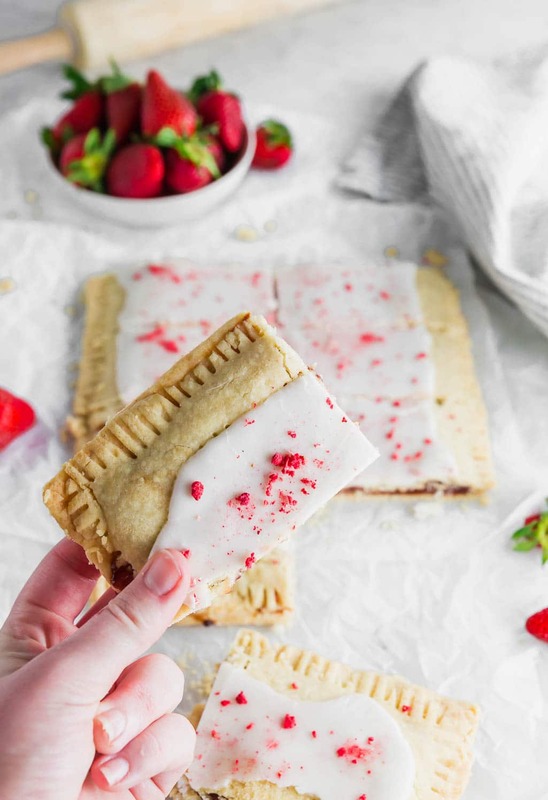 Serve this Giant Strawberry Pop Tart for a Gluten Free Brunch! 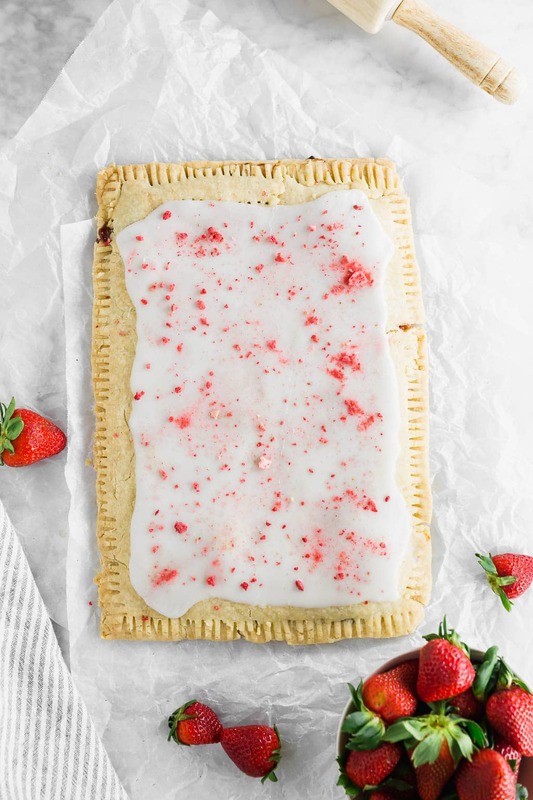 Whether you’re looking for a great pastry to serve for brunch or something special for a weekend breakfast with the kids, this giant strawberry pop tart is all you need to create an epic gluten free brunch. It’s so fun to slice and serve – and easier, too! Why fill and crimp individual pop tarts when you can make one giant one! If you're a pop tart lover then you have to try this gluten free and dairy free giant strawberry pop tart! It's as delicious as it looks with a flaky gluten free pastry, a luscious strawberry filling and a sweet glaze on top. Kids and adults alike will love this breakfast pastry. In a food processor, add the gluten-free flour blend, xanthan gum (if using), salt and sugar and pulse to combine. Add cold vegan butter pieces and pulse until the butter is the size of peas, with some larger pieces. Remove from food processor and place the flour mixture into a bowl. Add in water one tablespoon at a time just until your able to pinch the dough together. You may not end up using all of the water. Pat into a flat circle, cover with parchment paper or plastic wrap and chill in the refrigerator for about 20 minutes. While the dough is chilling, make the strawberry filling. Add strawberry jam to a small saucepan and heat over medium heat until warm. In a small bowl, mix together cornstarch and water and whisk until no clumps remain. Add the cornstarch slurry to the jam and whisk until combined. Bring the jam to a boil and cook, while stirring, an additional 3 minutes. Remove from the heat and allow to cool completely. Once the dough is chilled, roll out the dough into two equal rectangles about 8x11 inches each, about 1/4 inch in thickness. I like to place mine back into the freezer for 10 minutes for better handling. Preheat oven to 350F. Place one rectangle of pastry dough on a baking sheet lined with parchment paper. Spoon the strawberry filling onto the pastry and spread with a spatula, leaving about 1/2 inch border. Carefully place the other rectangle of pastry dough on top of the strawberry filling. Gently press the edges closed with your fingers. Crimp all the way around with a fork. Generously poke holes into the top of the pastry. Bake at 350F for 40-45 minutes, until the edges of the crust are lightly browned. Remove from the oven and let cool completely. While the pop tart is cooling, make the glaze. In a small bowl, combine powdered sugar, almond milk, and vanilla. Whisk until combined and no clumps remain. You want the glaze to be rather thick so it doesn't run off the pop tart but still spreadable, so add additional powdered sugar or almond milk to reach the desired consistency. Once the pop tart is cooled, spread the glaze over the pop tart with a pastry knife. Sprinkle crushed freeze dried strawberries over the top. Allow to dry completely before slicing and serving. You want the vegan butter to be very cold, so I like to cut it in small pieces and then freeze it for at least 30 minutes before using. If your pastry breaks while placing it on top of the other one, just patch it up. You'll be covering it with frosting anyways! You want to make sure you poke lots of holes into the top of the pastry before baking. This way, air will be able to escape and the pastry won't balloon up in the oven. If you don't want to cover this giant pop tart with a glaze, you don't have to! The pop tart will keep at room temperature for about 2 days. You can keep it in the refrigerator for 3-4 days, which is my preferred method of storage. Plus, cold pop tarts taste good! This looks so good! What a fun brunch idea to make with kids! Hi Vanessa! Usually 2-3 days at room temperature and 4-5 days when refrigerated. I hope you enjoy it Chrissi! Is that carb count per serving or for the whole thing?! 79g. Yikes!